Hot this week: Culture Crime News is back! Stolen Gods is looking for a student volunteer contributor. A viable but poor substitute for actual return of stolen cultural objects. With a link to a post by Sam Hardy. Good luck getting anything you left behind in Cuba. San Miguel Arcángel in Tijuana was robbed of the blessed sacrament, a chalice, and some money. The thieves entered via the bell window. The obliteration of historic graves for wrought iron. Members of the band Stereo Fire Empire found the ‘blue dog’ painting by George Rodrigue propped up against a wall only moments after they were discussing the theft. The artefacts were stolen from the Arkansas Archaeological Survey’s research station. The FBI continues its investigation. The family who had the bell agreed to return it provided they could remain anonymous. Taken from his Elmira, NY grave site sometime between Christmas and New Years. The 1997 painting “Wendy and Me” was taken from the Rodrigue Studio in New Orleans’ French Quarter. The chalice, taken from St Rose de Lima Church in Chikopee, MA, was based on the Ardagh Chalice. Pyx also taken. The anvil was taken from the Morrison Heritage Museum sometime in October. It weighs over 200 pounds and there is speculation it was taken for scrap. Not just repatriations TO Venezuela (e.g. Matisse’s Odalisque in Red Trousers), but also doing some returns themselves including 57 pieces to Costa Rica. The state has turned down far more claims made by churches for the return of property seized during the communist regime than it has approved. Many of these items are now in museums. The Museum of Cycladic Art in Athens has yet to decide if they will loan a piece to the British Museum after the Parthenon Marbles insult. 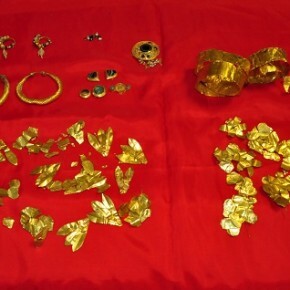 The collection of gold artefacts was found in a home in Imathia during a police raid. The crown was not actually made of gold but has great sentimental value. It was located two meters up on the high altar and the thieves removed the bolt that attaches it to the statue of the Virgin. Article does not name names. Both the suspect and his father have art galleries in Zürich’s city center. A church judge has blocked the sale of a 16th century piece. More anti deaccessioning. Profile of the founder of Mondex. Purchased by the NGA Canberra in 2007. Originally from Uttar Pradesh and sold by disgraced dealer Subhash Kapoor. The pieces were detected by scholars and Egyptian authorities and it has been confirmed that they came from post-2011 looting. Ivory bans in the art world: will Australia follow suit? In light of strong ancient/antique ivory sales, will Australia implement a near-complete ban like the United States? The bones almost certainly came from an archaeological site and were being sold in violation of New Zealand law. Around 4800 moa bones have been sold on the auctio site over the past 2.5 years. Profile of Mike Dickison of Whanganui Regional Museum who is trying to stop the sale of moa bones looted from archaeological sites. The priest of the 125-year-old temple discovered the robbery the next morning. 3 statues were taken. After the theft of the idol of Lord Raghunath in December it is unclear if residents of the district will celebrate or call off Basant Panchami, “the Hindu festival that highlights the coming of spring”. This is India’s ‘first ever comprehensive acquisition policy’. Thought is that with proper in-country acquisitions, the illegal export of art and antiquities will be reduced. Stolen from a temple at Lakhneshwardih Dham in Rasra area of Ballia district. Few details. Authorities now look to priests and temple workers as the theft of gold idol of Lord Raghunatha from Kullu last month remains unsolved. A delegation of the Jain Samaj met with police and demanded that the 46 idols and other items stolen from Sidhant Tirth Kshetra in Sikhorpur village in late December be found. The men were caught carrying the idols stolen from Ballia district recently. They suspects say the theft was planned and they meant to pass the idols on to smugglers. The piece, by the late National Artist Misiem Yipintsoi, was taken from the family collection . NONE of Misiem’s works are available commercially so family hopes it is unsellable. As part of the “Retrieving Artifacts” campaign “to encourage the local community to deliver any found artifacts” to proper authorities, a woman turned over 19 Neolithic artefacts and reported their findspot.